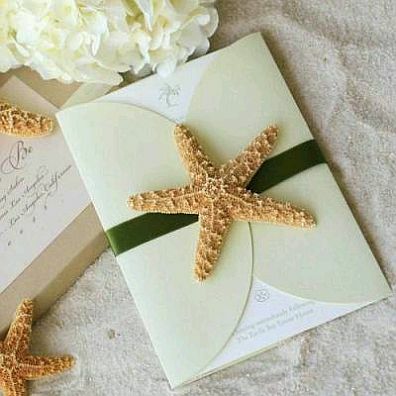 When planning a wedding, our main objective is that everything goes very well, the bride, groom and guests, remain pleased with every single detail. 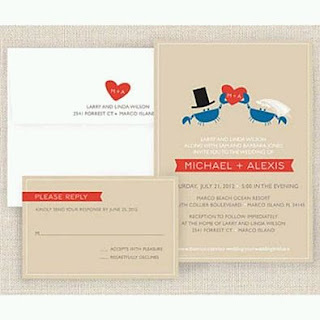 Precisely are the wedding invitations or cards, the first contact of those attending the big event, with boyfriends, so special care must be taken when choosing them, and of course, your style should be used in the wedding. 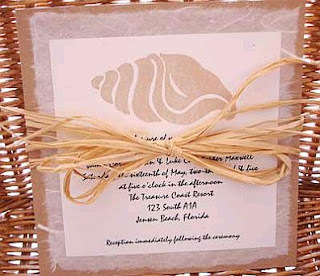 If your wedding is on the beach, here are some models that you may find valuable. 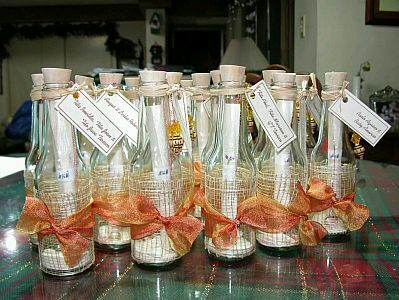 Original invitation, it is a scroll with information, placed in a bottle, for the decoration of it is perfect, we used a mesh tape. Fresh model wedding invitation is printed with the figure of a seashell, under wedding information and is tied with a ribbon bow paper. Original and funny wedding invitation, crabs are a couple of those who announce it, and in the bottom of the card is all the information. 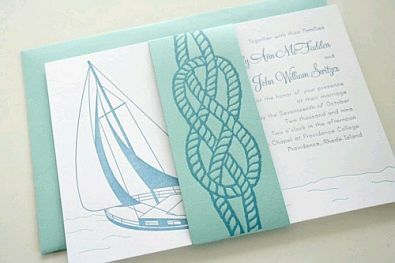 If you prefer models with boats and sailing cards, here are a very good printed card bearing the figure of a sailing ship on one side and on the other, the details of the wedding, amid a strip of paper with the figure of a sailor's knot, which in turn is a symbol of eternal love. Card model with applications in high relief on the front, the tie is paper tape. However, if you prefer invitations models for beach weddings that include sea stars, here are some interesting proposals. 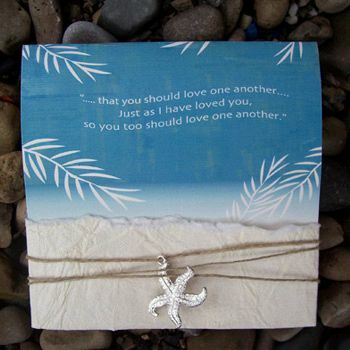 In this first model have a simple card that represents the sea and the beach, is tied with a rope and a pendant or silver pendant in the shape with a starfish. Beautiful and elegant invitation, in cream, tied with a green ribbon and a starfish on the front to close the card. 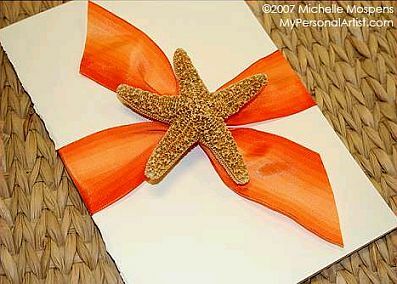 Surely, this contrast of colors caught your attention as soon as you saw, and it makes sense because the orange ribbon and golden starfish, achieve a perfect match. 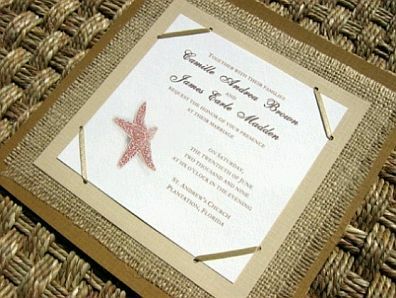 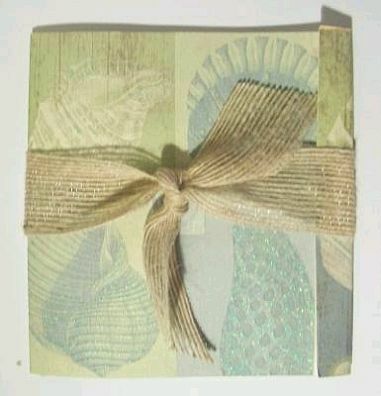 Finally, very eco model, with a jute backing, there is a card attached by the four corners and decorated with a starfish.